To defend a racist is not a profitable thing. To be baited into defending a racist is worse. Given the position from which you argue, any reasoned and coherent points get dismissed, if not ignored, for being conjoined with the indefensible. You become the straw man for which opposing forces were hoping. The old quote, “Don’t wrestle with a pig. You’ll both get muddy but the pig likes it,” doesn’t hold entirely because your place in the cast of these two characters is the pig. Tillman Hall, as a student at Clemson University in the 1980’s, was simply Tillman Hall. I never had a class there, rarely set foot inside of it, and had no consideration of it other than it was the postcard building for the campus. It was built in 1893, one of three buildings from the original campus, with a design comparable to buildings at Auburn, Ga Tech and other schools that began in that era. For many, it was where girls went for their “MRS degree,” aka the Education building. Hey, it was funny then, and it’s funny now. Good start, me. Racism and sexism in two paragraphs. Am I surprised? By the graffiti on a campus building, absolutely. To the point, certainly by the “violent” part. But, I didn’t know any of that. 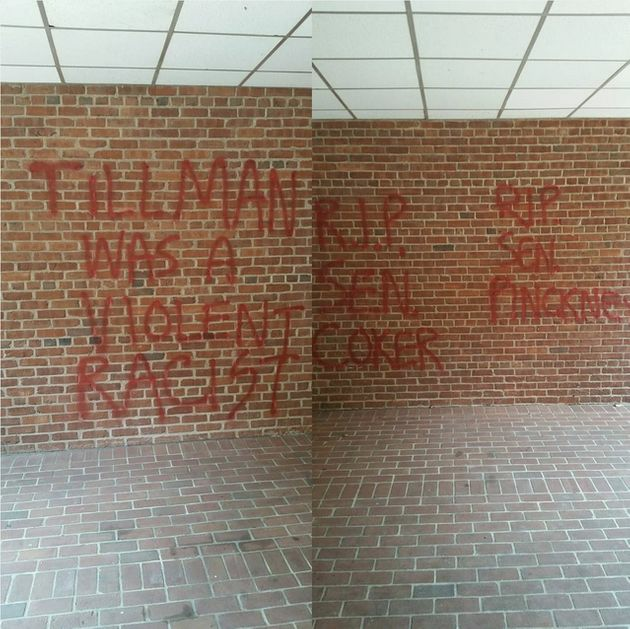 The internet wasn’t around back then, I didn’t recall any mention of Tillman in my South Carolina history classes, and… it was just a name for a campus building. He could have been one of the first professors. It didn’t matter. That was then; this is now. In context of the era in which Tillman mattered, post Civil War and into the early 20th century, does it surprise me that a southerner would be a racist? Not really, but neither would I assume that all southerners were. Would I be shocked that a racist to rise to be governor of the State? Nope. Or that he achieved enough wealth and power to help launch the school I attended? No, not surprised. And, frankly, not interested. I wasn’t here over a century ago. It’s wasn’t relevant to me when I was at the school and it isn’t today. Is it a big deal to rename a building on a public campus? South Carolina makes that somewhat problematic in that the State government has to approve name change. In any case, the process is there. Tillman Hall’s original name was Main Hall. That’s kind of pedestrian, and in the mid-1940’s, the SC government voted to change its name to honor Tillman and around the same time erected a bronze statue on the very troubled South Carolina State Capitol grounds. During a period in which the State could, they seem to have doubled down on the most distasteful period of history in the State. Unlike George Wallace, Tillman never embraced an enlightened viewpoint and his governance set in place racist policies for decades that followed. He’s not someone I would want associated with Clemson, and he doesn’t represent the character of the people or the institution that I’ve known and cherished. Until the past year, it seems, Tillman’s sins were irrelevant if not completely forgotten. So, there’s two sides to the argument. 1) Morality – should persons be judged in hindsight, outside of the culture of their times, and be held accountable for moral failures? It depends. How immoral was a person? What were the scope of the offenses? How severely inflammatory are those offenses in the current culture? How sizeable are the voices raised in opposition? 2) Historical - Should history be rewritten, generally speaking, by casting from public sight and discourse those who embody traits or activities which are against current values and opinion? Should good works or contributions be swept aside in favor of some number of people who are offended by that person? With the weight of instant mass media and an evolving social narrative, should an empowered nouveaux Taliban destroy any historical remembrance of false gods? Or should they remain, so history will not repeat? Outside of the context of Tillman, that war wages on issues large and small, from a comedian who (allegedly) drugs and rapes women, to a NFL quarterback who engages in dog fighting to a corporate drone who is stoned in the court of public opinion due to an offensive tweet. Names, reputations, livelihoods lost, and this in a society at once as permissive and intolerant as ever. “Every great institution is built by imperfect craftsmen," he said. "Stone by stone they add to the foundation so that over many, many generations, we get a variety of stones. And so it is with Clemson. Some of our historical stones are rough and even unpleasant to look at. But they are ours and denying them as part of our history does not make them any less so. “For that reason, we will not change the name of our historical buildings," Wilkins said. "Part of knowledge is to know and understand history so you learn from it. Clemson is a strong, diverse university in which all of us can be proud. That is today's and tomorrow's reality and that is where all our energy is focused." It’s history. Get over it. As Clemson’s TV commercials go, “The Paw says it all.” Well, that was a couple months ago. This is now. When it comes to racism, it’s open season on historical personages to find relevance for grievances that people hold today. And with Tillman, they’ve found the jackpot. The absence of Tillman’s place in the life of Clemson University is as irrelevant today as any hold of his influence on today’s population. Until his history resurfaced, he was irrelevant. Still, I understand how people would be offended when symbols of gross imperfection are allowed a measure of prominence. Or, more to the point, I wouldn’t expect Jews to attend any function named after Hitler or visit a facility featuring his statue. So, by all means, change the name. In the context of what has come to light, Tillman is not worth the aggravation. Recent reports indicate that the Board of Trustees is reconsidering the issue. With Clemson’s academic rankings and national status on the rise and in the light of national publicity on the issue, they really have no choice. It’s their job to protect the institution. And, if they do not, they will be made to care that the social narrative of the 21st century insists on new symbolic gestures to displace discredited symbolic gestures. That’s measurable societal progress. Next comes a less symbolic aggravation. I’d like to know who vandalized my school. Was it a student? Someone in the area who was invested in the process of renaming the building? Was it someone from a rival school, or thinks all South Carolinians are racist? In any case, it was someone whose intent was to stir the debate. I’d prefer that debate be absent vandalism to my school, but it is what it is. And it worked. Two days later, they successfully baited some ignorant redneck or a racist to raise a Confederate flag in front of Tillman Hall. I’d like to know who that person was, too. And if they had anything to do with Clemson, I hope they would be publicly cast out. Racism is not a Southern thang, or even an American issue. It’s part of the human condition and is observed around the world. But, for now, I’d rather the battleground move away from Clemson, away from South Carolina and away from the South. Let California enjoy the attention for a while, or Wisconsin, or… Maine. They hate Canadians, right?